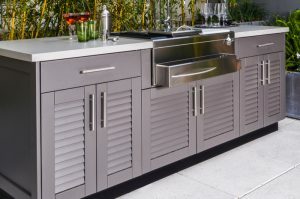 It goes without saying that if outdoor cooking is a fundamental part of your lifestyle, you want highly efficient and durable equipment to do the job. If you’re among those discerning chefs that take great pride in their outdoor cookers, you’ve certainly heard of a versatile creation called the Big Green Egg. A ceramic cooker that offers much more than a conventional grill, this product provides the ultimate cooking experience while delivering amazing results. 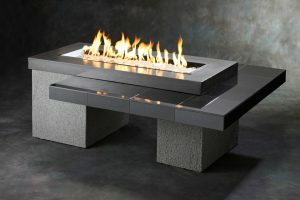 This outdoor marvel was created based on the ancient design for a ceramic cooking vessel known as the “kamado”. By blending modern technology with ancient tradition, the Big Green Egg delivers exceptional performance compared to other high-end barbecue grills, ovens or outdoor cooking systems on the market today. WHAT IS SO SPECIAL ABOUT THE BIG GREEN EGG? The Big Green Egg is a versatile cooker that serves as a grill, oven and smoker, all wrapped up in 5 convenient sizes (10″, 13″, 15″, 18 1/4″ and 24″ diameter). Using natural lump charcoal as a heat source, your cooker is ready to work in only a matter of minutes, and its exceptional insulating qualities offer consistent temperature controls that can be set with amazing accuracy. When it comes to outdoor grilling, you’ll be the star of the show. Whether you’re grilling steaks, burgers, seafood or veggies the pinpoint temperature control makes cooking any type of food a simple, enjoyable and tasty experience. With the Big Green Egg, you’ll be able to use the indirect cooking method to literally duplicate anything your indoor oven is capable of baking. Its ability to retain heat and moisture ensures that your food will remain juicy and rich with flavor. From casseroles, to pizzas, to apple pies, this cooker just might turn into your primary cooking device. As a smoker, the Big Green Egg is in a class of its own. No matter what cut of meat your family or friends should decide on, you’ll be amazed at what the Big Green Egg is capable of cooking. Whether it’s a turkey, a ham or ribs that are on the menu, your ability to precisely control cooking temperature will yield consistently delicious results each and every time. The Big Green Egg is extremely safe to use and cleanup is an absolute snap. This is a product that is built to last and has a warranty to back up the claim. With a host of accessories to enhance the experience even more, this outdoor cooker will offer you and your children, a lifetime of enjoyment. 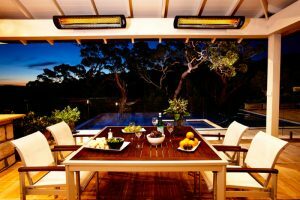 Outdoor Living Concepts in Palm Desert is a Big Green Egg Authorized Dealer. To find out more about Big Green Egg products and Eggcessories visit our Wholesale Design Showroom (open to the public). 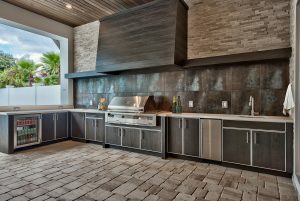 Outdoor Living Concepts also features a full line of barbecue grills, prefabricated BBQ Islands, outdoor patio furniture, patio heaters, fire pits & fireplaces and Jacuzzi hot tubs in our Palm Desert Showroom. Call us TODAY for a no-obligation in-home consultation at (760) 772-1182. Wholesale Design Showroom Open To The Public!